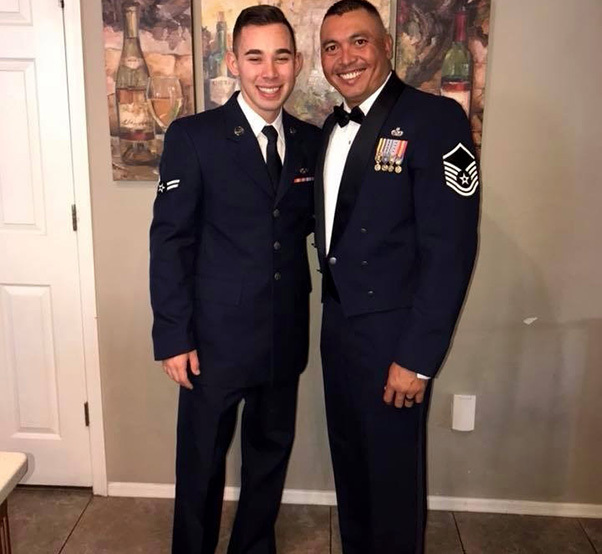 Senior Airman Anthony Castro and Master Sgt. Jonathan Herrera, assigned to the 380th Expeditionary Logistics Readiness Squadron Petroleum, Oil and Lubricants flight, pose for a photo at Al Dhafra Air Base, United Arab Emirates, Dec. 13, 2018. Castro is on his first deployment, while Herrera is potentially on his last deployment, as he’s nearing retirement. 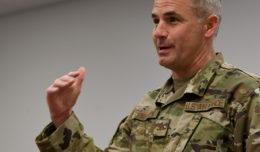 Oftentimes in the Air Force, the phrase, “It’s a small Air Force,” is said due to the chances people have of running into one another again throughout their careers. This duo’s chances were smaller than usual, but it happened anyway. 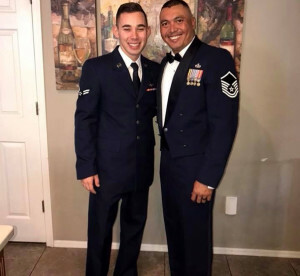 Airman 1st Class Anthony Castro and Master Sgt. Jonathan Herrera pose for a photo before Herrera’s SNCO Induction Ceremony at Davis-Monthan Air Force Base, Ariz., Aug. 31, 2018. 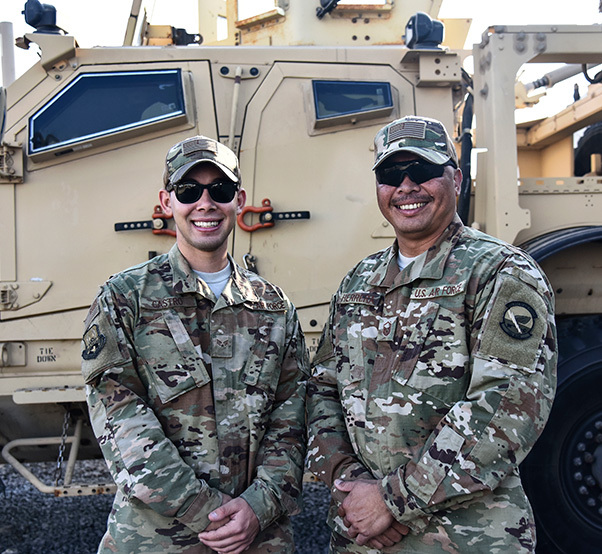 Herrera and Castro are a father and son duo both in the Air Force, assigned to the same Air Force Specialty Code, same duty station at Davis-Monthan Air Force Base, Ariz., and now the same deployed location at Al Dhafra Air Base, United Arab Emirates. 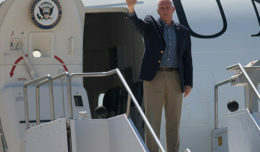 With Herrera’s many years of military experience, Castro already knew from a young age that there are boundaries between the Castro-Herrera family and Air Force family. As a 17-year senior NCO, Herrera uses his experience to ensure that Castro doesn’t miss out on any opportunities to be treated like any other Airman in the shop. 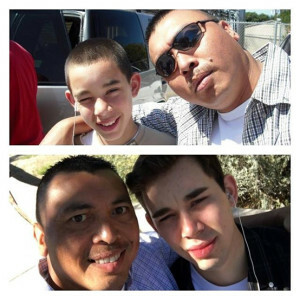 Jonathan Herrera and Anthony Castro pose for selfies in 2008 and 2016. 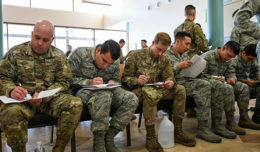 Herrera and Castro are a father and son duo both in the Air Force, assigned to the same Air Force Specialty Code, same duty station at Davis-Monthan Air Force Base, Ariz., and now the same deployed location at Al Dhafra Air Base, United Arab Emirates.